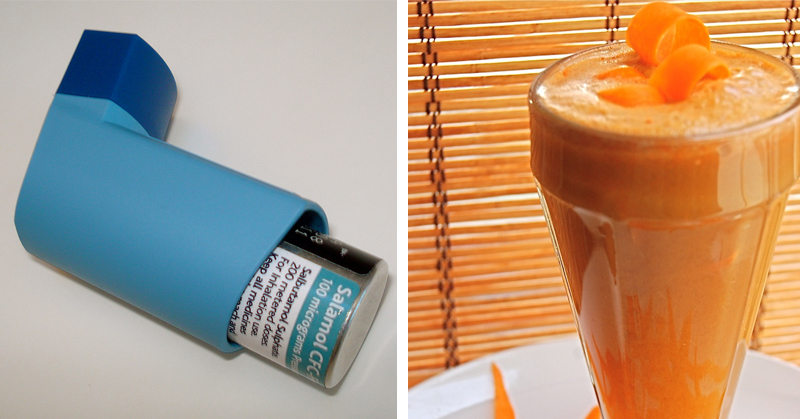 Now there is a remedy for asthma right at home, in your kitchen. Stop/reduce those asthmatic attacks with the right nutrition. Asthma is a condition in which the airways temporarily narrow in response to a certain stimuli that usually do not affect the airways in normal lungs. It is characterized by recurrent attacks of wheezing, coughing and shortness of breath that can range from mild to life-threatening. During such attacks, the small airways in the lungs suddenly become clogged with mucus and other secretions. If not cleared, the blockage can lead to suffocation. Studies have shown that the major underlying cause of asthma is a chronic inflammation and thickening of the bronchial tubes and nasal passages leading to dramatic muscle spasms, constriction of air passages and consequent breathing difficulties. Asthma patients who depend on inhalers that contain steroids may have the lung walls coated with this drug/chemical that may cause further breathing/respiratory problems over a period of time. It is a vicious cycle but one that needs to be broken. Making eating clean as a lifestyle should be one of the first steps to prevent further asthma attacks. 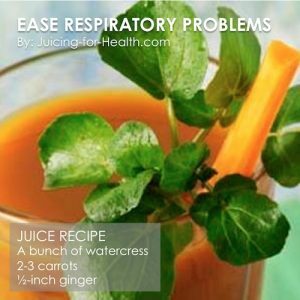 Eating/juicing plenty of healing fruits and vegetables will help reduce/eliminate the underlying inflammation of air passages, dilate the air passages, thin down mucus in the lungs, and reduce food allergy reactions that trigger asthma attacks. Although asthma can develop at any age, it usually begins in childhood, in the first five years of their life. Some children continue to have asthma into their adult years, in others it resolves. When a sufferer comes in contact with trigger matters, the airways narrow and the sufferer develops difficulty in breathing, accompanied by wheezing. Not all asthma attacks produce wheezing. Mild asthma in very young children, may result only in a cough. In older children, they may tend to cough only when exercising or exposed to cold air. In a severe attack, breathing becomes visibly difficult, wheezing becomes louder as the sufferer breathes faster and with greater effort, gasping for breath. Airway obstruction is often caused by abnormal sensitivity to chemical substances that inflame airways, making them swollen and stimulating the muscle cells in the walls of the airways to contract when they should not. Continuous use of steroids may also cause this. There are many potential triggers that cause these contractions, but most sufferers respond to only a few. Triggers include inhaled allergens such as pollens, particles from dust mites or feathers, and animal dander. Cigarette smoke, fumes or perfumes, cold air, viral infections, emotional distress, can also provoke asthma attacks. When you know what triggers your asthma attack, you can prevent flare-ups by avoiding them. An asthma attack induced by food commonly happens within minutes or an hour or so after eating the offending food. However, some reactions may take a day or more to appear, making it difficult for you to pin-point the culprit. I believe that by firstly avoiding foods that may aggravate, then maintain your health at an optimum level, you can keep asthma away—maybe even for good. Start by reading materials that teach you about optimum health; by exploring this site that teaches you about healing foods, and consistently applying them. A healthful dietary and lifestyle change will take you a long way. Sodium and monosodium glutamate. A diet high in sodium can increase the spastic constriction of your bronchial tubes that histamine causes. Alcohol in its pure form can actually help asthmatic constriction to a certain degree. BUT, the alcohol we drink is rarely pure, rather is usually an additive in beverages, such as beer, wine or distilled spirits. The remnants of the hops, the malt, the grapes, the barley, sulfites in wines or the corn from which the liquor was made may bother and trigger an attack. Eat/juice plenty of fruits and vegetables that are high in vitamin C and antioxidants. Juices easily help you achieve an optimal amount that is therapeutic. Fish oil high in omega-3 fatty acids, such as salmon, mackerel, sardines and tuna. In an emergency, drinking brewed coffee (but not instant or processed coffee) that contains caffeine, or tea that contains theobromine, was found to be an effective bronchodilators. These substances help relax and open up the bronchial tubes. Hot, pungent foods that provide immediate relief—chilli peppers, spicy mustard, garlic and onions. These foods have anti-asthmatic and anti-inflammatory properties. Carrot is one of the best foods in dispelling excessive mucus from the body. Drink carrot juice just on its own, or add a few ribs of celery for its super cleansing power. High intake of beta carotene and vitamin C (with flavonoids) helps to increase lung capacity and relieve respiratory problems, as well as protecting you from breathing disorders such as asthma, bronchitis and emphysema. A diet that is high in chlorophyll helps promote detoxification of the liver and colon by getting rid of the toxins, thus reducing the sensitivity to inflammation. Beetroot and pineapple have very potent anti-inflammatory properties. Drunk regularly, it can be beneficial for reducing the frequency of the attacks. Guava juice, strawberries, blueberries, cranberries and most berries have very high content of antioxidants. Most asthma sufferers cannot stomach citrus fruits so these are to be avoided.